A California man accused of driving to New Jersey and fatally shooting his estranged wife and another man inside a church on Sunday has been captured in Georgia. 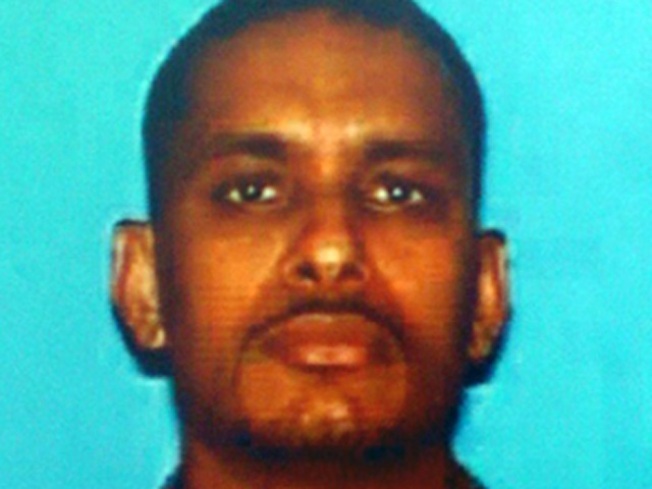 Joseph M. Pallipurath was captured around midnight Monday in Monroe, east of Atlanta, said New Jersey district U.S. Marshal James Plousis. Pallipurath, of Sacramento, is suspected of shooting and killing 24-year-old Reshma James inside the St. Thomas Syrian Orthodox Knanaya Church in Clifton, a suburb about 15 miles west of Manhattan. Also killed was Dennis John Mallosseril, who witnesses say had tried to intervene when the couple argued. A third person, James' cousin, Silvy Perincheril, was shot in the head and was hospitalized in critical condition. In California, the suspect's father had called on him to surrender, as did relatives of one of the victims in New Jersey. Pallipurath waived his right to extradition Tuesday morning in a Georgia court about 40 miles east of Atlanta. Georgia authorities say they will arrange his return with New Jersey authorities within 10 days. The 27-year-old was wearing a jail jumpsuit and shackles. He answered only "yes" and "no" to the judge's questions on the charges and extradition process. He did not have an attorney. James had taken out a restraining order against Pallipurath, prosecutors said. Mallosseril, who maintained the church's Web site, had tried to break up the church rampage, they said. The shootings occurred in a church whose members are mostly first-generation immigrants and their children from Kerala. All three victims were shot once in the head and didn't regain consciousness, depriving investigators of the opportunity to interview them. James died at 3:30 p.m. Sunday, and Mallosseril died three hours later. The search for Pallipurath, who fled in a vehicle with California license plates, had centered on Georgia, where he has relatives, prosecutors said. Pallipurath is accused of opening fire Sunday just as the congregation was finishing its prayers for the dead, a staple of weekly worship service. Authorities say he fired more than three times but only three people were hit. No one else was injured. After fleeing three months ago from what relatives said was an abusive, arranged marriage in California, James moved to New Jersey and stayed with Perincheril, who lives in Hawthorne. The couple were married just over a year ago in India and moved to Sacramento in January. Reshma's aunt Maria Joseph, of Hartford, Conn., said she warned her niece, who was studying to become a nurse, not to marry him. Other relatives told her the man had a history of "behavioral problems," Joseph said. Mathai Pallipurath, the suspect's father, said he thought his son and daughter-in-law were happy together, and he described his son as "handsome" and "a nice guy." According to a published report, however, the elder Pallipurath was granted a restraining order against his son in May. The father said Joseph was abusive to family members and had threatened his life. In the story posted on its Web site Monday, The Sacramento Bee, citing family court records, said the restraining order was dropped at Mathai Pallipurath's request on June 17. Mathai Pallipurath was not available later Monday to comment on the report. A man who answered the phone at the family's Sacramento home Monday evening said he did not wish to speak further. The parish priest, Rev. Thomas Abraham, said he heard a loud noise and thought something had fallen in the church. He got up to go toward the noise, only to be hit with a wave of parishioners pushing him backward, saying someone was shooting inside the sanctuary. He said church members were in shock. "They're all scared; they're all really upset," he said. "We have to hold together in this time of adversity."